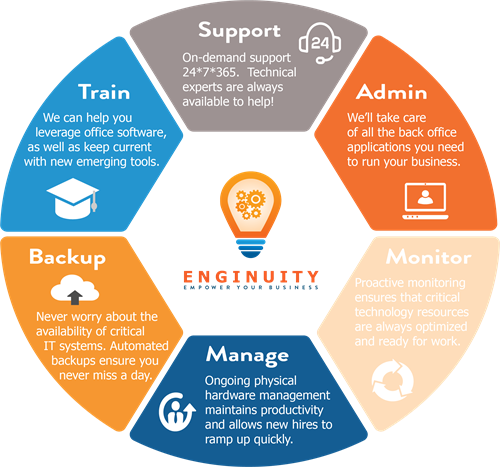 Enginuity Technologies is a premier technology partner for small to medium sized companies. 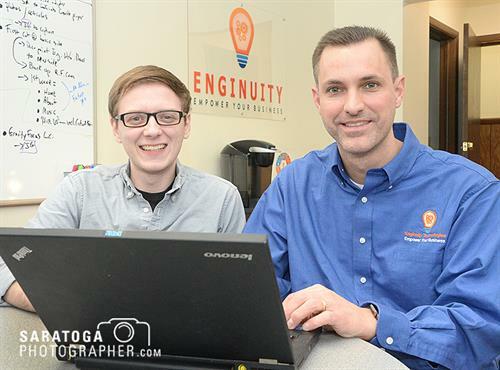 Headquartered in Saratoga Springs, New York with a national reach, Enginuity goes beyond simple technical services to keep your daily business running. As your IT partner, we're intensely focused on enriching small and medium-sized businesses by delivering enterprise-class IT capabilities in a cost-effective way. We cover the full spectrum of your company’s technology needs so you can focus on your core business. Our team’s extensive start-up and large corporation expertise offers invaluable technical and business proficiency that will help your company get off on the right foot and support long term growth. 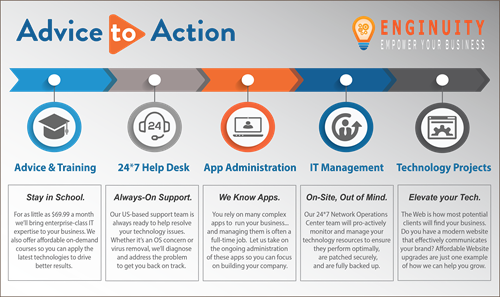 We draw upon years of experience supporting IT applications, monitoring and managing IT infrastructures 24 * 7, setting up automated business continuity solutions, and providing innovative training services.
? We offer enterprise-level technology services at affordable prices.
? Our exclusive focus enables us to stay closely in tune with the needs of the small to medium business segment.
? Our wide breadth of solutions cover the full spectrum of IT needs regardless of how far along you are in the development of your business.
? We are technologists, but we are also business people. We will work closely with you to deeply understand your business and offer IT alternatives that help you lead in your respective market.